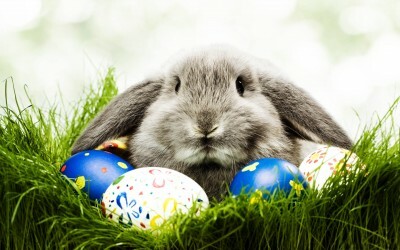 Unlike wind power, this little fella is a harmless fantasy. When it comes to assessing the costs, risks and benefits of environmental policy, Bjørn Lomborg is one of the very few that provide balanced, detailed analysis; properly supported by facts and evidence. The economic choices we make – about allocating scarce resources to unlimited wants – should – as Lomborg consistently points out – be made taking into account all of the costs weighed against properly measured benefits (see our post here). Bjørn Lomborg has become one of the most high profile critics of insanely expensive and utterly pointless renewable energy policies across the globe (see our posts here and here and here). For his efforts, Bjørn cops stick from both ends of the political spectrum: climate change-cultists deride him for his honesty about the insane cost and utter uselessness of wind and solar power; hard-core AGW challengers damn him with the tag ‘luke-warmer’, for his open acceptance of ‘global warming’, as a problem worth attention. STT takes a different view again. Our attack is directed at a meaningless power source; that is insanely expensive, and utterly pointless, on every level. For those on both sides of the argument (including “AGW deniers” as they’re referred to) that foolishly connect industrial wind turbines with global warming (or climate change) they, in effect, box themselves into a logical corner. On the one hand, if the AGW hysterics are wrong (and icebergs start turning up in Port Phillip Bay), then, applying their (by then failed) man-made CO2/warming argument, we should scrap every last (planet cooling) wind turbine and start burning coal and gas as fast as humanly possible to warm the joint up, in order to prevent the ‘big freeze’. 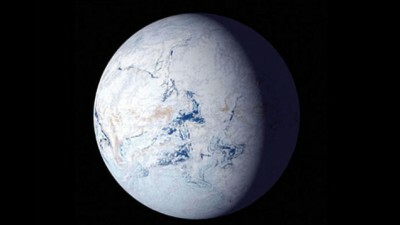 Ice Age One: the way we were, 700 million years ago. Thank God things warmed up from there. On the other hand, if the AGW “deniers” are wrong, temperatures start to rise, and Australia looks set to become a boiling desert, devoid of all life forms (save card-carrying “Greens”, of course), then the hysterics will claim absolute licence (if not high moral imperative) to carpet this, and every other country, in an endless sea of giant industrial wind turbines. Having pinned their arguments against wind power on the basis that CO2 caused AGW is a furphy, the “deniers” would be forced to logically concede their opponents’ case; and, with it, to also concede the need for a completely wind powered electricity system. 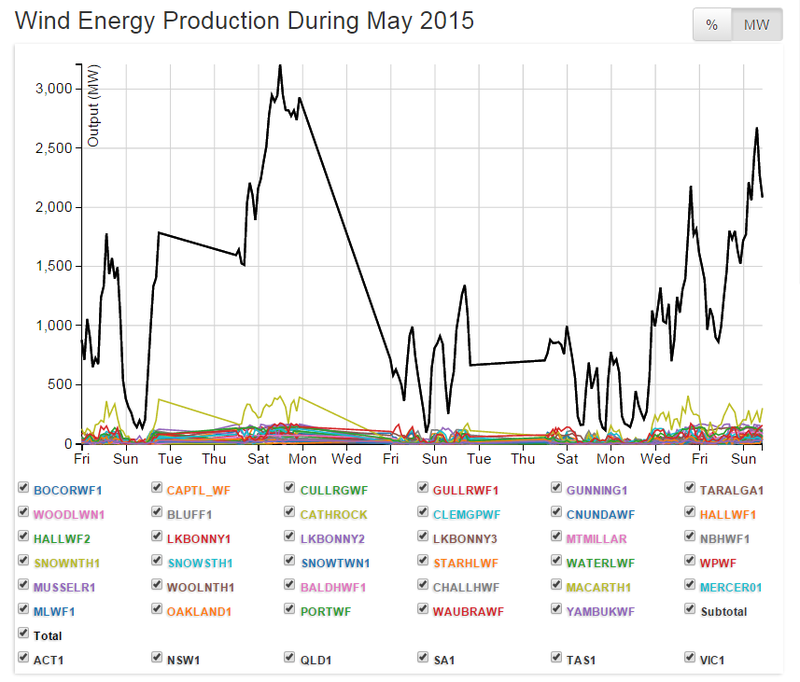 Wind power isn’t a ‘system’, it’s ‘chaos’ – the pictures tell the story: this is the ‘output’ from every wind farm connected to the Eastern Grid (based in NSW, VIC, TAS & SA – and with a combined installed capacity of 3,669MW) during May. And it’s at about that point that STT and Bjørn Lomborg are ad idem, again. Lomborg might be faulted on many things, but he is on very firm ground with his analysis of the insane cost and complete pointlessness of attempting to ‘rely’ on a wholly weather dependent power generation source. Here he is dishing out the stuff that the wind industry just hates to hear. We’ll be global warming when we can have power source cheaper than coal. The next climate summit is approaching in Paris and expectations are once again high – despite it being the 21st of its kind, after 20 summits that have achieved almost nothing. In reality, Paris – like Copenhagen, Lima, Warsaw, Doha and all the others – is very unlikely to achieve any significant progress. This is the conundrum: we know climate change is a problem, but we sadly keep trying to solve it with a solution that has failed repeatedly. As the saying goes, “insanity is doing the same thing over and over again and expecting a different result”. CO2 emissions keep rising ­because there is a very close connection between energy use and gross domestic product. Remember, we don’t burn fossil fuels to annoy the environmentalists but because they power everything we like about modern civilisation, from light, heat and cold to transport, electricity and food. Line up GDP growth during the past 20 years with the CO2 growth, and there is an almost one-to-one correspondence. The evidence from the World Bank across two decades is clear: grow 1 per cent GDP a year, and your CO2 emissions remain constant – like Italy. Grow 3 per cent and your CO2 emissions grow 1.5 per cent – like New Zealand. Or grow your economy 10 per cent like China, and increase your emissions by 6.3 per cent. Yes, it is possible to reduce emissions and still keep the economy growing – but it will grow less, meaning there is a real cost. While some nations such as Germany have been able to buck the trend – growing the economy 1.3 per cent while decreasing emissions by 1.2 per cent – a similar number of nations have increased their emissions even more. India has grown 6.5 per cent and increased its emissions by almost as much. Australia is a little ahead of the curve with 3.2 per cent economic growth and just 1.3 per cent CO2 growth. The traditional climate approach has been for politicians to promise CO2 cuts. Of course, few will vote for politicians who deliberately cut economic growth, so instead politicians promise lavish subsidies for renewables such as solar and wind. Yet mounting costs for renewables eventually become a drag on the economy. And they solve little since these new renewable energy technologies are not yet mature. Contrary to what many people believe, renewables will not get us off fossil fuels anytime soon. According to International Energy Agency data, 13.1 per cent of the world’s energy came from renewables in 1971. In 2012, renewables’ share was essentially unchanged at 13.2 per cent. The vast majority of this energy comes from biomass, or wood and plant material, humanity’s oldest energy source. While biomass is renewable, it is often neither good nor sustainable. Burning wood in pre-industrial western Europe caused massive deforestation, as is occurring in much of the developing world today. The indoor air pollution that biomass produces kills 4.3 million people annually. And modern energy crops increase deforestation, displace agriculture, and push up food prices. Despite the hype, the contribution of solar and wind are essentially trivial. Today, after endless climate summits, good intentions and generous subsidies, the world gets just 0.4 per cent of its energy from solar and wind electricity, according to the IEA. It will still be insignificant a quarter of a century from now. In the optimistic, green IEA scenario, solar and wind will contribute just 2.2 per cent of global energy by 2040. The simple but uncomfortable truth is that solar and wind are not ready – they are too expensive and need expensive back-up when the wind is not blowing or the sun not shining. What does this mean for Paris? Even in the scenario that activists hope for, where governments sign a pact to enforce every one of the carbon-cutting promises they have made so far, the summit will do very little. In a new peer-reviewed research paper, I find that if all nations keep all the carbon-cutting promises they have committed to ahead of the summit, temperatures will be cut by just 0.05C by 2100. And even if every government on the planet not only keeps every Paris promise, reduces all emissions by 2030, shifts no emissions to other countries but also keeps these emission reductions throughout the rest of the century, temperatures will be reduced by just 0.17C by 2100. Yet the UN’s climate chief Christiana Figueres is hopeful that the Paris promises could limit the forecast temperature rise to about 2.7C by 2100. This is nothing but wishful thinking and a misrepresentation of the world’s options. The 2.7C comes from the International Energy Agency and essentially assumes that if governments do little in Paris and then right after 2030 embark on incredibly ambitious climate reductions, we could get to 2.7C. Figueres’s own organisation estimates the Paris promises will reduce emissions by 33Gt CO in total. To limit rises to 2.7C, about 3000Gt CO would need to be reduced – or about 100 times more than the Paris commitments (see figure). And still the paltry reductions that are promised are achieved at a significant cost. Take the EU 20-20-20 climate policy, which would have reduced temperatures by just 0.007C. Even if this were extended across the entire century, the reduction would be 0.026C by the end of this century, according to one of the Intergovernmental Panel on Climate Change’s own climate models. The Stanford Energy Modelling Forum, the gold standard for the economics of climate and energy, has done several studies that show us two things about costs. First, and perhaps not surprisingly, the official cost estimates are often much lower than reality. The EU estimated the total cost of its 2020 policies could be as little as an annual 0.4 per cent GDP loss or €64 billion ($97bn) a year. The peer-reviewed cost was 1.3 per cent or €209bn annually, or more than three times larger. Second, politicians rarely pick the smartest climate policies that cut CO2 most effectively. This typically doubles the cost. The EU could have reduced its emissions by switching to gas and improving efficiency for a GDP loss of 0.7 per cent. However, phenomenally inefficient solar subsidies and bio­fuels are catnip to politicians, which is why the actual EU cost almost doubled to 1.3 per cent of GDP. The EU now plans to cut its emissions by 40 per cent below 1990 levels in 2030. While there are no direct estimates of the cost of this policy – extraordinary in itself – the latest peer-reviewed Stanford Energy Modelling Forum for the EU looks at the cost of cutting 80 per cent in 2050, which results in a reduction of 41 per cent in 2030. That reduction would cut the EU’s GDP by 1.6 per cent GDP in 2030 or €287bn in 2010 euros. This assumes that carbon is cut as effectively as possible. Without this assumption, the cost is likely to be closer to $900bn. And it will in total reduce temperatures by the end of the century by just 0.053C. Any conversation on climate needs to look at China. In the nine years from 2004 to 2013, China’s emissions have doubled and in 2013 China emitted almost one-third of all CO2. China emits twice what the US does and three times the EU’s emissions. We hear seductive talk of China as the “green giant” and how it is making the “world’s biggest push for wind power”. Yet the facts from IEA show that China gets a trifling 0.28 per cent of its energy from wind and an almost immeasurable 0.02 per cent from solar. By 2040, the IEA optimistically expects that China will get a still-trivial 2.6 per cent of its energy from solar and wind. China has promised by 2030 to reduce its ­energy intensity to at least 60 per cent below 2005. These climate policies, in the most optimistic circumstances, fully achieved and adhered to throughout the century, will reduce global temperatures by just 0.048C by 2100. India has been clear that it will not reduce its emissions. Despite persistent claims that it is becoming green, this is a thin veneer. Today, India gets 0.31 per cent of its energy from wind and 0.02 per cent from solar and even by 2040 solar and wind will likely contribute less than 2 per cent. Africa is the world’s most renewable continent. It gets 50 per cent of its energy from renewables compared with just 12 per cent in the EU. But this is because Africa is poor and has little access to modern energy. The almost 900 million people living in sub-Saharan Africa without South Africa each use just 185kWh a year, less than a typical fridge. Thirty-five Africans use less energy than the average German. Not surprisingly, Africans want to use much more energy, mostly from fossil fuels. Solar and wind energy makes up a trivial 0.03 per cent of energy now and less than 1 per cent by 2040. The Obama administration plans to spend billions of dollars to electrify Africa. The Overseas Private Investment Corporation, the main US development finance institution, prefers mainly to invest in solar, wind and other low-emissions energy projects. During the past five years, OPIC has invested in more than 40 new energy ­projects and all but two were in renewables. A paper by Todd Moss and Ben Leo from the Centre for Global Development showed that if the US spends the next $US10bn ($14bn) on gas electrification, it could help lift 90 million people out of poverty. If it uses only renewables, the same $US10bn can help just 20 million to 27 million people. Understandably, economic growth to lift millions out of poverty is much more important than cutting CO2 to China, India and Africa. During the past 30 years, China has lifted 680 million people out of extreme poverty, using cheap, if polluting, coal. Telling China to slow down that process with immature and expensive renewables is not likely to succeed. With 800 million extreme poor in India and Africa, expecting India and Africa to go renewable is plainly wishful thinking. Climate change is not our only challenge and the world’s poor face more important problems. The World Health Organisation estimates that global warming causes about 141,000 deaths a year, and it expects that as global warming progresses it will cause 250,000 annual deaths by 2050. This definitely underscores the fact global warming is a problem. Yet it also pales in comparison to seven million deaths each year, now, from air pollution, 800 million starving, and 2.5 billion people living in poverty without clean water and sanitation. Yet, in line with the message from climate summits, most First World leaders increasingly insist their aid money should be spent on climate. The OECD estimates that about one in every four dollars of all measured, bilateral development aid today is spent on climate-related aid such as cutting greenhouse gasses like CO2. But this is not what the developing world wants. The UN has asked more than 8.5 million people from around the globe for their top priorities. Not surprisingly, they want better education and healthcare, less corruption, more jobs and affordable food. They put global warming at the bottom, as priority No 16 of 16. The problem with global warming as an overarching policy conversation is that the leaders of richer countries, from Barack Obama and Angela Merkel to Justin Trudeau or John Key, increasingly seem to tell the world’s 2.5 billion poor and hungry: here is money to cut your CO2. While undoubtedly well intentioned, that is morally indefensible. Climate campaigners often argue that the deployment of renewables also pushes green innovation. By building lots of wind turbines, we should get more wind innovation. However, a German parliamentary commission looked into the question and unambiguously concluded that the subsidies did not create green innovation because it was much safer for companies to keep relying on heavily subsidised wind turbines, solar panels and biomass instead of further developing existing technologies and develop new, viable alternatives to fossil fuels. The subsidies simply create the wrong incentives and the commission concluded they “have failed to reveal significant positive innovation impacts”. Subsidised deployment is clearly not the way to create the needed innovation. A lesson on innovation can be found in the computer. We did not obtain the computers of today by mass producing them in the 1950s to get cheaper vacuum tubes. We did not provide heavy subsidies so that every Westerner could have one in their home in 1960. Nor did we tax alternatives such as typewriters. The breakthroughs were achieved by a dramatic ramping up of research and development, leading to multiple innovations, which enabled companies such as IBM and Apple eventually to produce computers that consumers wanted to buy. And we now have a great example of how innovation can reduce CO2. The shale gas revolution in the US was made possible with the US government spending $14bn on R&D during the past three decades. Fracking has pushed gas prices down, replaced dirtier coal with less polluting gas and cut CO2 emissions by about 300 million tonnes in 2012. This is more than three times what the EU’s expensive wind turbines and solar cells cut every year. And while the EU pays about $56bn in subsidies to solar and wind every year, the US makes $390bn annually from the shale breakthrough. This shows the potential for climate breakthroughs when policy recognises the need for innovation. During the Copenhagen Consensus on Climate project, 28 climate economists and a panel of experts including three Nobel laureates found the best long-term climate strategy is to dramatically increase investment in green R&D because it ultimately will make green energy cheaper, making everyone switch. The estimates show that every dollar spent on green R&D will help avoid climate damages worth $11. This is 100 times better than investing in today’s inefficient solar and wind energy technology. The present climate policy has been failing for 20 years and is likely to keep failing. We would love to believe that green energy is just about to take over but, even 25 years from now, solar and wind will be minuscule players. We would love to believe that renew­ables are just about to get competitive. But actually the bill is only getting bigger. Last year, the world paid $184bn in renewable subsidies. In 2040, these are expected to cost even more, at about $297bn. The present climate policies are based on wishful thinking, which only very rich countries such as Germany can afford. For the developing world, it matters more to get out of poverty, to stop malaria and hunger. Rather than counting on the world suddenly choosing to pursue a policy that directly goes against the economic interests of everyone, the Paris climate summit should focus on dramatically increasing the funding of green R&D to develop the next, cheaper generations of green energy. If we innovate the price of green energy down below the price of fossil fuels, we will finally start tackling global warming. Bjorn Lomborg is an adjunct professor at the Copenhagen Business School and directs the Copenhagen Consensus Centre. of cooking with twigs and dung for Indians. No matter whether you agree or not with the dangerous man-made warming orthodoxy, one thing that is clear is that no matter how many windmills and solar panels we install it will make virtually no difference to the total global energy mix. My comments will be brief. I disagree with Mr. Lomborg that CO2 drives global temperatures up. It does not. It is not an issue. What is an issue is low level sulphur and petrochemical pollution from “dirty” burning methods. Use some of the money you are throwing at renewables to clean up the mess you are already making. Increases in CO2 atmospheric concentrations ALWAYS FOLLOW ANY INCREASE IN TEMPERATURE, and then abate by the increased CO2 dissolving into the oceans. The oceans are the CARBON SINK. There is no impending climate catastrophe. It is a “Chicken Little” hoax. Renewable energy technologies are very inefficient; 25% for wind and 10% for PV solar. Would anyone pay with their own money for such farcical things? To impose this on the world must fuel some other ulterior purpose. Perhaps it’s to control the changing political complexion of the world? This is, in part, information that I have learned from reading Tim Ball, PhD’s, 2014, “The Deliberate Corruption of Climate Science”. That would make “deniers” out of us in greenie eyes. I’m glad to still be sane. If we are the only two left on this benighted planet to enjoy freedom from the green delusion, that’s fine. I think that, perhaps, more of you get it. Well stated. I am with you, Mr. Rosenthal. Modern society is ‘contemporaneous ‘ ie. every day that dawns brings with it a new beginning – history is irrelevant, there is no yesterday from which anything can be learned, therefore.